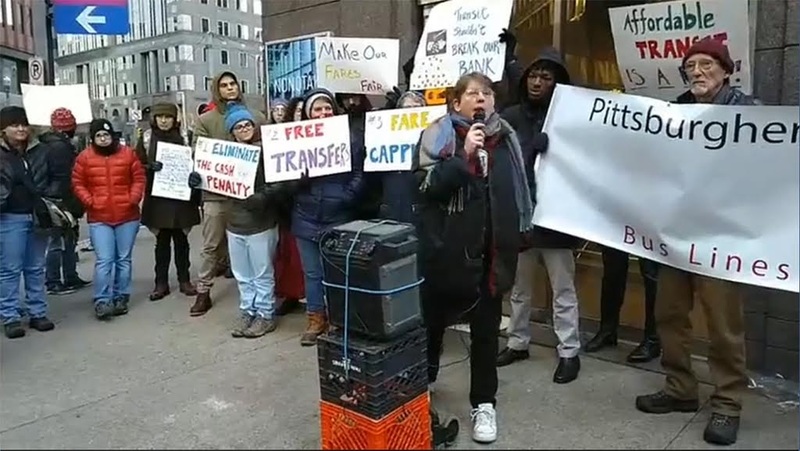 Mel Packer delivered the following as testimony to the Port Authority of Allegheny County (PAAC)’s Board of Directors on December 7, 2018. He was there to support the delivery of 2,500 petition signatures urging PAAC to adopt three policies to create fare equity in the transit system. For the next three minutes, I’d like to detail the transit woes of a low-wage worker we’ll call Rider X who is quite representative of so many low-wage Port Authority riders. Rider X used to live in the city limits and was able to get to her $8/hour job on one bus, which meant she was laying out $2.75 each way or a total of $5.50/day. Even that was pretty tough and she sometimes had to borrow bus fare from a neighbor, but she made it to work. But along came gentrification, Rider X’s city rent went sky high, and she was forced to move into the de-industrialized suburbs, which have the only rental units affordable on her wages. But Rider X gets up every morning and dutifully goes off to work at an $8/hour job, even though the income she makes barely covers rent, food, and bus costs. See, she now has to take TWO buses to get to her job and because she is forced to pay cash, it costs her $2.75 for the first bus and $2.75 for the connecting bus. That’s $5.50 just to GET to work and then another $5.50 to get home. Do the math: that’s $11/day just to get to an $8/hour job. If she could find a place to buy a Connect Card, it would only (ONLY!) cost her $2.50 per ride plus $1 for a transfer, but that still works out to $7/day, which is the same cost as a daily pass if she could figure out how to buy one. Now, Port Authority has already determined that $7 is the value of an unlimited daily pass. So why is Rider X, by paying cash, laying out almost 50% more without a pass for only 4 rides? Sounds crazy, right? But it gets worse. If she could, somehow, get enough money together for a weekly pass, she’d only lay out $25. But right now, she’s paying $11/day times 5 days for a total of $55/week, more than twice as much as a weekly pass. If she could get a Connect Card, she’d still be paying $35/week or $10 more than the weekly pass. If you figure it by the month, and if she could afford a monthly pass, she’d have unlimited rides for $97.50. But instead she pays about $230/month. Why? Because it’s damn near impossible to get $97.50 together at one time when you’re working for minimum wage. wants to find a way out of her grinding poverty, because she fell for the American dream and thinks if she works hard, she’ll get ahead. But instead she’s simply digging herself into a hole with a shovel Port Authority is helping to provide. weekend trips to church, shop, medical appointments, etc. unfair, highway robbery, counter-productive, and just plain morally wrong. We MUST, we have to, we can’t afford NOT to, and we cannot morally justify NOT going to a system of fare-capping. That’s the only way that low-wage riders can afford to ride the bus to get to work. of her 4th work day, she’d have a weekly pass on her card. That would mean she might be able to start saving a few bucks a week, treat herself to a movie, maybe realize that she could now take some classes to gain new skills because now some of her rides won’t require more of her cash. I have no doubt that we all want to see an equitable, world class transit system in Allegheny County. But we will never realize that dream if we continue to build that system on the backs of the poor – and that’s exactly what our present fare system is doing. It has to stop. I suspect that most of us sympathize with Rider X’s plight, so let’s do something about it. Let’s figure out a way to institute a mass transit system with free transfers, penalty for cash fares, and fare-capping — the only fare system that’s fair for all. Mel Packer is a retired 73-year-old transit rider who has been actively involved in social justice movements, specifically those with anti-capitalist politics, for most of his adult life. He has been an activist with Pittsburghers for Public Transit for many years.